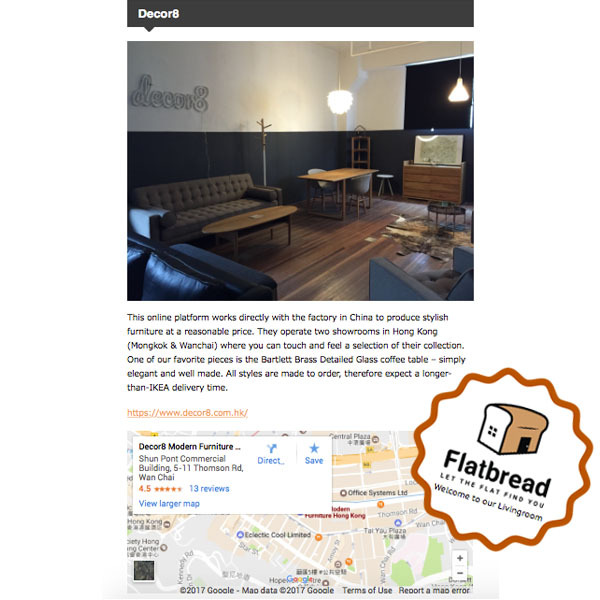 It was a great pleasure to see Decor8 on the 7 Must Bookmark Places to Find Your Next Furniture Other Than IKEA list from Flatbread. Whilst it is true that there is a wait time for most of our items, but you know what they say right? Good things comes to those who wait! You’ll be happy to know that we hold an all year round sale for our products and even go as far as having extra promotions every now and then. Why not have a browse at our Decor8 website for some great ideas? Check us out at one of our showrooms conveniently located near public transports in Mong Kok and Wan Chai. Also, if you would like to read the full article, you can check that out at this link. This entry was posted in Decor8 Furniture Showroom and tagged living tips.